In my youth I developed a love for classical music, I even went as far as playing bass in several orchestras. As such I could appreciate the unimaginable talent required for all five children in a single family to actually be accepted to the ultimate, the Juilliard School of music. Collectively known as the 5 Browns, these talented young people; Ryan, 19; Melody, 20; Gregory, 22; Deondra, 24 and Desirae 25 are perhaps the best concert level pianists I have ever had the pleasure to hear. Their back story is equally interesting. Each of the Brown children started to play piano at the age four. Their mother, a trained vocalist, wanted her children to share her love and appreciation for music so all five grew up with music as an integral part of their lives. The press kit included features on Oprah and Sixty Minutes II that where about the 5 Browns. While Oprah concentrated on the amazing and uplifting feat this family accomplished, Sixty Minutes focused more on some the details of how they got to where they are. The parents felt that school is seven hours away from home for three hours of education, with non-necessary factors like PE, home room and study hall taking up far too much of their valuable time. The parents would awaken the children at 4:30 AM to get a few hours of practice in before school. Acting on this the parents pulled the kids out of school for home schooling. While many would consider this obsessive the fact is these are no ordinary children and it is only natural that their education should reflect it. These young musicians not only have incredible talent but they seem to enjoy performing. The looks on their faces, while sometimes a bit affected, reflect a true love for their art. Their entire bodies are animated, flowing with the notes they produce. The fantastic appeal to their performances is the way they can slide without effort between complete harmonies, a true synergy while maintaining their distinct musical personalities. Desirae and Deondra play duets as if they share a common mind, Gregory is fearless, using bold forceful technique, and Melody’s playing reflects a sweet and carefree style while Ryan is the story teller of the group. The key here is while they often play together each can stand on his or her own as a brilliant and inspired musician. It is also noteworthy that this is also a very good looking group of young people. While so many musicians their age are pierced, tattooed and dressed in provocative clothing they present themselves with a demeanor befitting classical musician, neat and polished. While many people deride this younger generation the Brown children give hope to us all. They have the dedication ad work effort to succeed. Several of the compositions they performed are especially scored for the unique combination of five pianos. They shift the focus, each taking the lead at times and then yielding to a sibling. They create a musical tapestry where each individual thread is incredible but together it is nothing less than wondrous. Their presentation of Rimsky-Korsakov's The Flight of the Bumble Bee is awe inspiring. Starting simply, one piano after another joins in, they merge, separate and revolve around each other. Bernstein's "Scenes from West Side Story" starts off with the five snapping their fingers, one by one they move to the keyboards and Bernstein never sounded better. They move from one familiar song to another in a seamless and beautiful fashion. Grieg's "In the Hall of the Mountain King" from Peer Gynt, Op. 23 builds slowly, pulling the listener in as the five Browns’ fingers dance around the keyboards, one taking the low, ponderous tones while the others layer in the lighter, higher registers. Not all of the selections use all five of the siblings. They break off into pairs, they each get solos. They are not some hive collective; they can each stand on their own in the highly competitive world of the concert pianist. Their youthful enthusiasm can hopefully reach out to their peers and show them that there is more to music than the pop, rap and other forms so popular today. There is beauty and grace to their performances and it is infectious. It you are at all human you will not be able to resist the charm of these performers. This is not a gimmick as so many may think. While it is at the edge of statistical probability that all five children should have such a high degree of talent they are each dedicated to making their own way in the fray of concert musicians. They appear to be extremely close as siblings go, able to work well together without losing their individual approaches to the music. They are still very young and the future holds much for them but it seems that they have the dedication necessary to accomplish it. After the first time I listened to them I was an immediate fan and look forward to anything they release, as single performers or together. I had the pleasure of interviewing these amazing young people and talking to them was as much of a delight as listening to their music. They are exuberant, with not only a true love of music but also an enjoyment of life. They where very forthcoming when I asked if they every delved into musical genres other than classical. While they personally enjoy many types of music they specialize in bring the classics to a younger audience. Desirae and Deondra took the lead in the discussion but everyone was anxious to get a word in about what they do. They came across as young people that are remarkably well adjusted, socialized with strong ties to family and their faith. When asked about how the pieces they performed are arranged they admitted that they have people that do that but the tell them to make the pieces as difficult as necessary, they will work to meet the challenge. This remains one of my favorite interviews of all time. 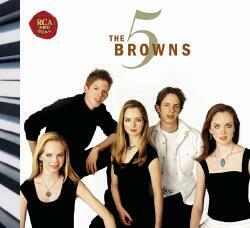 BMG Classics is premiering a novel and exciting new format with the February 8th release of the 5 Browns. On one side of the disc there is the standard music CD, the other side will hold a DVD video presentation. Both will prove to be worth it on their own but together it will be a purchase that will be uncounted hours of enjoyment. Whether you feel like just closing your eyes and listening or you want to intently watch their animated performances this release will fill the bill. Its not often that such a group of young performers comes along that provides such a fresh approach to well loved classical music but they 5 Browns have done it. Even if you never considered classical music your ideal this is a worthwhile additional to your musical library. The talent of these five performers is incredible and will make you a classical music fan in no time at all. Look out for all of them in the future, their careers are just starting and holds the promise on incredible achievements.